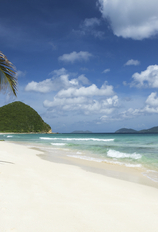 For a variety of reasons, Americans typically don’t head to the Caribbean in summer. Many prefer to visit stateside beaches, or explore the capitals of Europe, rather than spend their vacation on tropical islands. And then there’s the ever-present risk of hurricanes, a major factor keeping tourists away. The secret, however, is that there are several islands outside the traditional hurricane belt that enjoy pleasant summer weather and also experience the price drop associated with summer in the Caribbean. Aruba, Bonaire, and Curacao, known as the “ABC Islands” may be ideal destinations for a summer Caribbean getaway. Best yet, these islands offer a diverse array of options for any traveler, with affordable prices to reflect the low season. And despite it being summer, trade winds blow in from the east, keeping the islands’ temperatures comfortable. Whether you want just to relax on the beach, snorkel or dive in world-famous waters, golf, shop, or sample a host of cuisines, these islands offer a multitude of attractions to suit any type of traveler. Aruba is a well-developed paradise. Resorts line many of the island’s white sand beaches; boats and jet skis ply the aquamarine waters; and casinos, performance venues, and bars give the island more nightlife than its neighbors. The island is a popular place for wreck diving and snorkeling, and it hosts an international amateur windsurfing tournament each year. However, Aruba also offers appeal uncommon for a beachy island destination. Its burgeoning culinary scene blends international influences with local flavors, providing a welcome break from the bland-and-forgettable approach to food taken by many tourist-friendly tropical destinations. And, in Arikok National Park, you can find miles of hiking trails that feel more than an island away from the beaches and buffets of the coast. Off-road tours give visitors the chance to see the rugged northern coast, and day trips to San Nicolas in the south offer a glimpse at the island’s laid-back, Caribbean side. Summer continues to be considered low season on the island, though as more people discover the pleasant temperatures and lower prices of the season, it may not remain so for long. The airport is served by 16 commercial airlines, and JetBlue is petitioning to begin flying there in September. Aruba is also one of the only countries in the world to have U.S. customs in its airport, a perk that can spare vacationers the long lines stateside. For more tips on travel to Aruba, visit the SmarterTravel.com Aruba Travel Guide. When you go to Bonaire, you visit a place where the people have put the island first. Two-and-a-half decades ago, Bonaire declared the waters surrounding the island a marine park. It was a move that preserved the small island’s coast and coral reefs, and today has made it one of the world’s top destinations for scuba and snorkeling. It’s no surprise then, that diving and snorkeling are the big draws. Dive resorts, complete with dive centers, on-site experts, classes, and equipment lockers dot the island. The island has 60 official dive and snorkel spots, plus another 23 off the white sand beaches of Klein Bonaire, the tiny island tucked into the crescent of Bonaire. Bonaire is also known as a bird-watching hot spot. Its almost 200 species of birds include flamingos, parrots, and herons. It’s also a choice destination for those who want to do…nothing. The slow pace and lack of crowds give visitors room to relax. If the kicking back gets old, bicycling, sightseeing, and kayaking can punctuate the warm and breezy days. Bonaire has less direct air service than the other islands, though there are plenty of options for flights via nearby centers. Continental offers direct service from Houston. 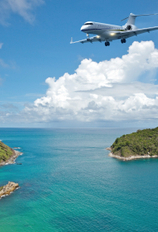 Air Jamaica flies between the island and Jamaica. And Dutch Antilles Express flies between Aruba, Curacao, and Bonaire; while Divi Divi Airlines flies from Curacao. Since Aruba and Curacao are served by more airlines, these short-hop flights open up the options for getting to and from Bonaire. For more travel information, go to the Bonaire Hotel and Tourism Association website. Amid tropical palm trees and historic buildings painted vibrant pinks, yellows, blues, and golds, you may hear Curacao’s locals speaking any one of four languages: Dutch, Papiamentu, English, and Spanish. The island boasts many types of cuisine, from beachside seafood bars to elegant steakhouses, and a lively nightlife scene. And cultural options include a slave history museum, the oldest Hebrew synagogue still in use in the Western Hemisphere, and historic architecture. You could spend your whole vacation at the beach, but you’d be missing out on what this unique island has to offer. No trip to Curacao is complete without a tour of Willemstad, the island’s capital city and a UNESCO World Heritage Site. Here, visitors can see Dutch architecture, shop, dine at fine restaurants, take a Caribbean cooking class, and spend an evening at a local lounge or nightclub for salsa dancing, live music, and tropical drinks. Cultural travelers and those interested in history may want to spend an afternoon at the Kura Hulanda Museum, which chronicles the slave trade. Around the island, visitors can tour the Den Paradera herb garden, full of natural remedies and soothing plants; the Curacao Ostrich and Game Farm, where you can feed the ostriches; and the Curacao Sea Aquarium, to view sea turtles, sharks, and other marine wildlife up close. For beaches, locals consider Big Knip, Kas Abou, and Porto Marie among the loveliest. Other outdoorsy travelers can find adventure activities both on land and sea, with plenty of dive and snorkeling options, horseback riding, and hiking. For more tips on value for your Curacao getaway, visit the SmarterTravel.com Curacao Travel Guide. Depending on your travel preferences, you can have a Caribbean vacation that’s relaxed, rugged, cultural, or culinary—or perhaps a combination of everything. Regardless of what island you visit, Aruba, Bonaire, and Curacao can offer a Caribbean vacation free of hurricane woes. And with casinos, diving, hiking, and culture, not to mention the beaches and low-season prices, you may find yourself planning a return visit next summer.